Designed for sport competition driving. This suspension coilover kit is designed with full adjustable ride height feature which retains full shock stroke length and spring preload. 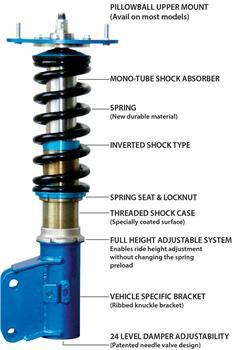 The inverted shock is made from light weight aluminum and features a mono-tube 24-step shock absorber. The specific internal valving is designed both for those who mainly track their vehicles and at times, drive it on the street. The inverted damper prevents external elements from entering the shock casing and retains structural rigidity for added stress loads applied to the coilover. Comes with camber adjustable pillow-ball upper mount and/or rubber upper seat depending on its vehicle application.